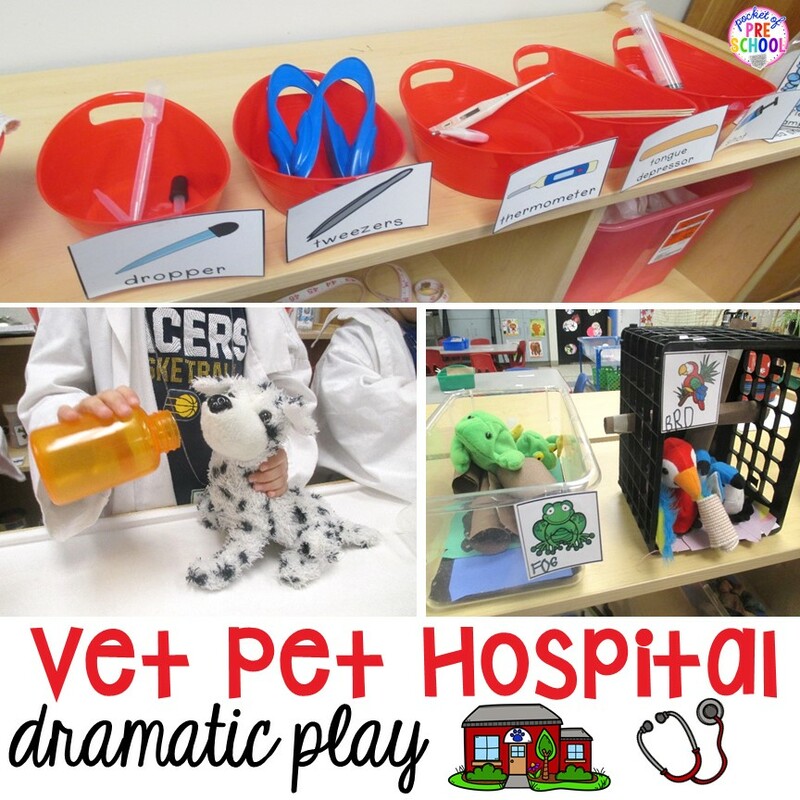 Change the dramatic play center into a Vet Animal Hospital and embed a ton of learning into their play! They won’t even know they’re learning. My students LOVED taking care of the pets and making all the pets at the pet hospital feel better. If you want all my Pet Hospital printables (plus much more) click HERE. Our class did a pet theme for four weeks. The photo above was taken after the four weeks. The first week we spent a few days creating the Pet Hospital. Students created the pet bedding by cutting strips of paper (fun fine motor work), creating the cages and making various props for the pet hospital. For small group, students added words to the signs and labels for the center. I have a multi-age classroom with three-, four- and five-year-olds. Some students are scribbling, some are writing letters, and some are sound spelling. Making signs and labels provides students with a meaningful way to practice sounds, talk about and write letters. Each week, I add one or two new props to keep the students excited and engaged in play. On the wall, I posted photos of pets. The photos are from a wall calendar. Wall calendars have fabulous photos you can use all over your classroom. Each tool has its own tub and label. Labels show students where things belong. We turned the fridge into the medicine cabinet. We used a roll of toilet paper for bandages. The pet hospital in action is so exciting for the students! The pet owners had to make appointments with the receptionist. With this activity, students were identifying numbers, talking about time, and writing! When the pet owners arrived with their pets, they could to sit in the waiting room and fill out a pet patient form all about their pet. What did the vet do? Give check ups and listen to the pet’s heartbeat using a stethoscope. If the pet is sick or hurt, the vet gave the pet medicine. The vet measured the pets using a dog bone ruler. This is a fun way to practice measuring and counting during play. The vet weighed pets on a scale. I didn’t have a scale so we made one. We covered a piece of cardboard with foil and taped the edges. A pre-k friend wrote numbers and drew a button on the top. The vet completed a vet report explaining how they took care of the pet after the exam. Broken bone? The vet gave the pet an x-ray on the x-ray machine (aka the light table). Examine REAL pet x-rays to determine if the bone is broken. Don’t have room for a light table? Try this table top light table. The groomer stand was stocked with various tools and supplies to clean the pets. The groomer brushed the animals’ teeth, cut their hair, washed and dried them and wrote a groomer report. Students can learn so much through pretend play when you intentionally embed learning opportunities into their play. Make their play purposeful and powerful! Play with them and have fun learning. Grab my Vet Pet Hospital Dramatic Play HERE. I did all the work for you. Just print, prep and teach. You don’t have to create anything! 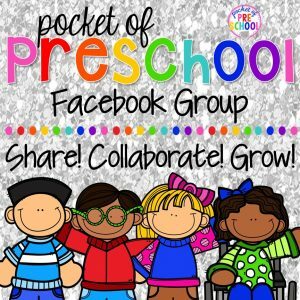 If you need pet themed ideas for all the centers in your classroom, I have a giant list of my go to Pet Themed Activities HERE. Don’t forget to grab the Goldfish Graph FREEBIES while you are there too! Need more inspiration for a pet theme? Follow my Pet Theme Pinterest board. 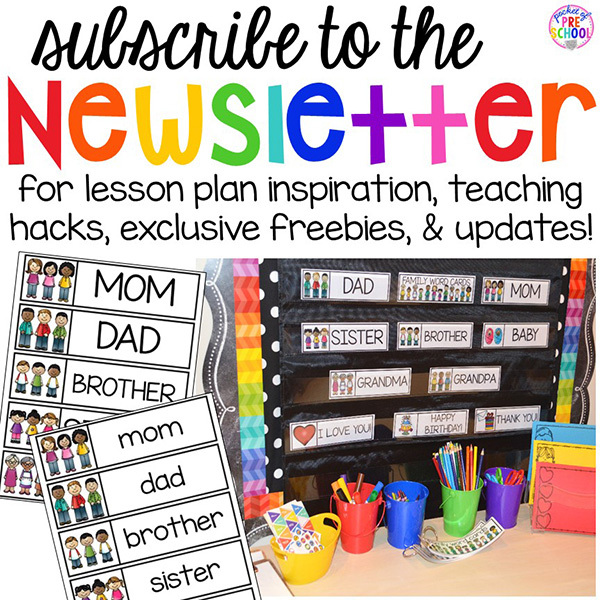 Previous Post: « Winter Themed Activities and Centers (Snowman at Night Freebie too)!